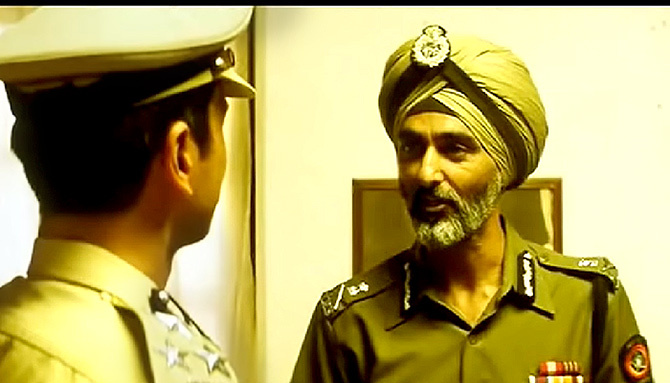 It is rare to see an actor, who played Mumbai's police commissioner in an acclaimed film, play a building watchman in real life. But then again, no one said an actor's life is easy. Or secure. Savi Sidhu, who starred in films like Black Friday, Gulaal and Shool, learnt it the hard way. 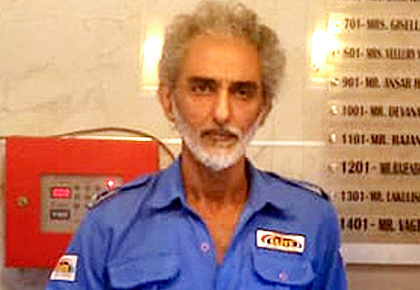 The 54-year-old tall and lanky man ran out of luck after his last film, 2014's Bewakoofiyaan, and had to find a job -- any kind of job -- for survival. 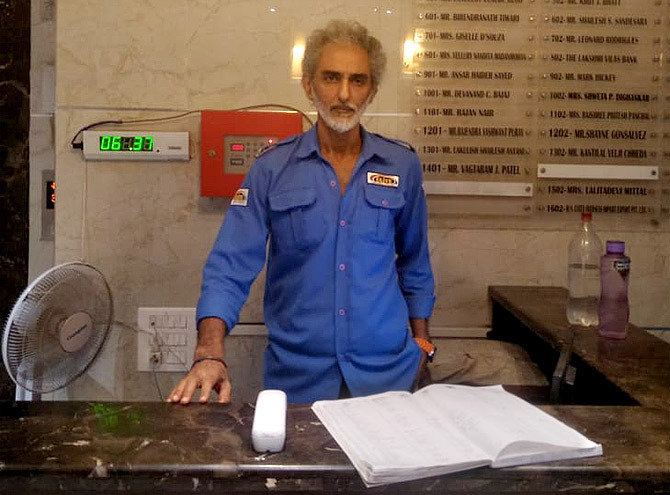 Savi Sidhu works at a 16-storey luxury high-rise in Malad, north west Mumbai, which overlooks a busy park. Strains of Teri Bindiya Re from the Amitabh Bachchan starrer Abhimaan can be heard from a radio in the lobby, where Savi Sidhu takes his place. "I've seen a good childhood, a good life," he tells Ronjita Kulkarni/Rediff.com, as he peeks into his past in a village in Punjab. "I got admission in college in the sports quota as I used to play basketball," he adds. At 6 feet two inches, his height adds weight to his personality. He took up law in Lucknow, but did not complete it. That's when he was first introduced to the stage. His brother got a job in Air India in Mumbai, and that made it easier for him to come to the city. He got himself a PG accommodation in Juhu, north west Mumbai, where many Bollywood stars live. He enrolled in a dance class, and that helped him bag his first film. A lead role, no less. Unfortunately, the film Phoolon Ke Zakam, opposite Moon Moon Sen, never released. He went on to do more films, but a recurring health problem forced him to lose out on work. Savi Sidhu cannot quite explain the problem but claims that there is no medicine or exercise for it. "The abdominal muscles tighten up," he says. "So when I'm doing a scene and this happens, my expression or body language will not match the dialogue I'm saying. That's how I lost out on work." And it set off a domino effect in his life. "My wife passed away. Then one by one, my parents, my in-laws, my other relatives... I was shattered," he says. After Bewakoofiyaan, the offers dried up, and the financial problems started. Finally, when the money ran out, he started looking for work. "I have no shame in asking for work," he says with a smile. He landed a security job, and has been working as a watchman for the last two months. IMAGE: Savi Sidhu in Black Friday. The building, where he works, has 128 flats, and has made life very busy for Savi Sidhu. "A security job is like the army or the police. Long working hours, less payment," he says with a chuckle, referring to his meagre monthly salary of Rs 9,000. A day off means a pay cut. But there is no time for loneliness or to mope over a life that has gone so wrong. "It's so busy that you don't have time to think about your problems," he says, shaking his head. "I never had any frustrations. My fate could have been much worse. I knew I would bounce back," he adds. After his long duty hours of 8 am to 8 pm, Savi Sidhu goes back to an empty house to cook. "There is no one to help me, and that's really tough. It's a one-man show," he says, then adds, "I cook quite well. I can make mutton, chicken and fish. Fish is expensive so I cannot afford it now." Right on cue, a colleague brings him a paper plate of bhel, his evening nashta. He offers it to me graciously, and when I decline, he keeps it aside politely. IMAGE: Savi Sidhu with Akshay Kumar and Dimple Kapadia in Patiala House. The radio show has now cut into an upbeat ad, and the mood changes. He points to a name plate and introduces me to the person, who changed his fate. "Birendranath Tiwari (president, Federation of Western India Cine Employees) knew me from before, and got me an interview with Film Companion. Then, a hungama started!" he exclaims. The interview went viral and got a lot of response from Bollywood. Mika Singh offered him a role in the Bipasha Basu starrer Aadat. "Mika Singh sent a car over to pick me up and take me to his home," Savi Sidhu says, with a smile. Savi Sidhu has been trying to fit in auditions into his busy schedule, and has already gone for a couple. "People I haven't spoken to in 30 years are coming forward. I hope this response converts into work," he says. IMAGE: Savi Sidhu with Ayushmann Khurrana in Bewakoofiyaan. "I left my job as a watchman!" Savi Sidhu exclaims over the phone. "I have joined Mika Singh's company Music and Sound and I am in his office now," he says happily. Savi Sidhu has bagged a short film as well as a role in the Bipasha Basu-Karan Singh Grover feature film, Aadat. "Mikaji said khao, peeyo, exercise karo, mera gym hai, designer kapde mangva doon...he's doing such seva! He's such a nice man! I was so surprised. I want him to get married now!" Savi Sidhu gushes over the phone. "And it all happened with just one meeting." He has started giving auditions as well, including one for Dharma Productions. "I had become a watchman overnight. Now, my life has changed again, overnight. I've seen so much in life. I have learnt so much from my ups and downs," he says. Savi Sidhu is living his dream again.